Welcome! This week was huge for comic books with the release of DC Universe Rebirth #1, Justice League #50, Steve Rogers: Captain America#1 and plenty of other cool announcements. Here are in my opinion, the most important news of the week. This is a new subsbscription service that works like Netflix, but for comic books. The downside is there are no Marvel & DC titles, and it only applies to Vol. 1-2. Having this said there is a lot on here to keep you busy with thousands of titles. It charges an affordable $6 a month and has a Free 30 Day Trail. I haven’t used the app yet, but I know it is part of the the main Comixology app which means it will be an extension of that. I hope this service gains the comic industry more followers! Let’s hope it boosts the sales up. The huge 70 page one-shot offers huge announcements. I won’t spoil anything, but all I’ll say is that there is a return of a beloved character and a ‘return’ of a new character. I am excited by all I read and can’t wait to see where DC will go next with their Universe. My spoiler review can be read here: CLICK HERE if you wanna know which characters are involved. Another thick issue with a lot of huge reveals, twists, and excitement. We find out more about the Joker’s identity. No spoilers, but I will say this explanation makes a lot of sense if you’ve read Batman comics recently. You might not like it, but it does make sense. A lot. I don’t know if this is good news, so I’ll have to wait for the proper story before I decide. Wonder Woman also gets a new story plot introduced that I won’t spoil, which is in my opinion more exciting. It was like DC Universe Rebirth #1, a very great story filled with shocking moments. To find out what the reveals were PRESS THIS! On Wednesday along with all the DC titles we had a release of Steve Rogers: Captain America #1. If you are reading this there is a high chance you know what the reveal is, but I will still be nice for maybe that one person and not spoil a thing. I am a giant fan of Captain America! The entire internet went crazy. My friends who don’t read comics even asked me about this. Where do I stand on this? I think we should wait until we get more information or an actual explanation. We need to keep in mind this plot twist was uncovered at the last page of the issue! We need to wait for an explanation before we start jumping the gun, burning the comic, or death threatening the writer. We have to stop overreacting when the story didn’t have a chance to fully prove itself! As much as I love Cap. he is also just a fictional character. Character changes are bound to happen weather you like them or don’t! Leave the writer alone! Plus it was a well written issue. 25 Years have passed since the release of the first issue of Bone! 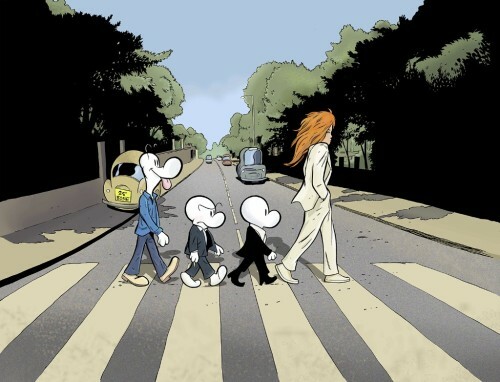 Jeff Smith will celebrate this by bringing a new comic in July called Bone: Coda. This comic will see the return of Fone Bone, his cousins, Thorn and it will bring us their first adventure in Bonneville. We’ll finally see Boneville! Yay! I actually can’t wait for the release of this. I loved the older comics and it helped they were critically acclaimed. ‘Coda’ means an additional piece of a structure so, I would expect for this be a closure to the entire franchise. Which of the news stories interests you?! Sound off in the comments below and let’s have a conversation. Answer the poll below!